Google Autocomplete is an incredibly useful search feature. Previously called Google Suggest, it was introduced as a way for users to perform quick searches. It has also been a valuable marketing tool by SEO professionals and digital marketers to help perform keyword research and explore search intent. The Autocomplete function has become more common today than it was years ago. Platforms like Quora and Wikipedia have also incorporated this clever feature into their search function. It has grown so popular that there are even memes and popular shows created around the topic! Google Autocomplete is a search feature within Google that allows users to complete searches faster as they are beginning to type. It can be found in Google’s search box, the Google app, and anywhere else that has a Google search box. The Autocomplete feature is powered by RankBrain, a key component of Google’s machine learning search algorithm, that uses deep learning that helps users get better results. From historical data acquired by RankBrain, it reads signals and search patterns to sort out search results, page rankings and gives predictions to user queries. And through these predictive models, Google Autocomplete was born. How does Google Autocomplete work? When you begin typing in Google’s search box, the algorithm performs a prediction of possible search queries and shows a drop-down list of related words and phrases. The terms you are typing. What other people are searching for, including Trending stories. From there, you can select a search query that either exactly or closely matches the one you intended to enter. Not only will it help you perform searches quicker but Autocomplete also shows popular or trending queries that are being searched by other people. Contrary to popular belief, Google does now show keyword suggestions in its Autocomplete feature but instead displays predictions. It’s designed to help complete searches of queries that you intend to find. It does not, however, provide suggestions for new searches. We look at the real searches that happen on Google and show common and trending ones relevant to the characters that are entered and also related to your location and previous searches. Any searches performed on Google will be influenced by your location and language settings, even in Incognito mode. The city, province, or country you’re in all can produce different suggestions. The language settings of your browser also have an impact. Different suggestions will appear if you’ve told Google that you prefer to search in a particular language. A significant part of Google’s algorithms is to continuously learn about your browsing habits and personalizing search results based on your historical search data. The results that you see in Google Autocomplete will be personalized for you. The first two comes from your own search data, followed by the rest that is ranked based on popularity and relevancy. How to know which search query came from your own search history? You will see the “Remove” button next to the keyword. Just like Google’s SERP, the Autocomplete feature shows a list of searches based on popularity. But it doesn’t always show queries that are historically popular, like evergreen queries with high-volume searches. But the Autocomplete results are more often influenced by relevancy. Which comes first, high-volume searches or trending topics? 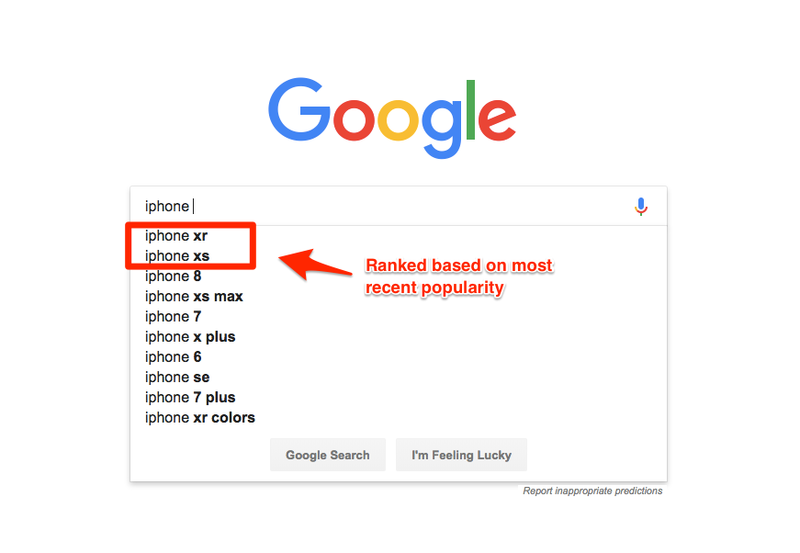 Popularity plays a pretty big role in keyword rankings. But Google will often prioritize relevant results over high-volume, popular keywords. Google algorithms have a measurement called the “freshness layer.” Whenever there are queries that show a sudden increase in a short period of time, they will show in Autocomplete. It can happen despite a relatively low search volume for the search term, depending on its recent virality. 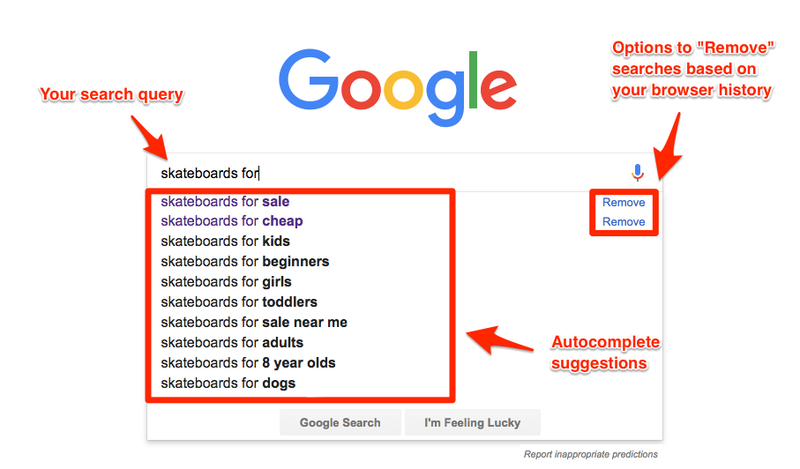 Using Google Autocomplete can be a powerful tool for performing keyword research. It’s a great place to start for the early stages of content development and implementation of organic search strategies. Since the Autocomplete function shows a list of related keywords based on popularity, it’s an ideal way to kick-start your keyword planning for SEO. But most importantly, it can give valuable ideas of quality long-tail keywords. Long-tail keywords are incredibly useful when fulfilling content gaps, but also offers many possibilities in terms of high-value blog posts and educational content within a brand’s niche. Note: Search by using Incognito mode, or sign out of your Google account. It will give an anonymous, hence an unbiased Autocomplete result. But relying on the Autocomplete function alone might not be enough as Google limits the number of keyword suggestions given. Keyword Tool, on the other hand, pulls data straight from Google Autocomplete and Adwords Keyword Planner. The tool gives you a larger set of keyword data, alongside other important metrics like search volumes, cost-per-click (CPC), keyword competition levels. Once you have identified a set of high-volume keywords, you can now use it to create new content ideas that have a higher potential to perform well on SERP. 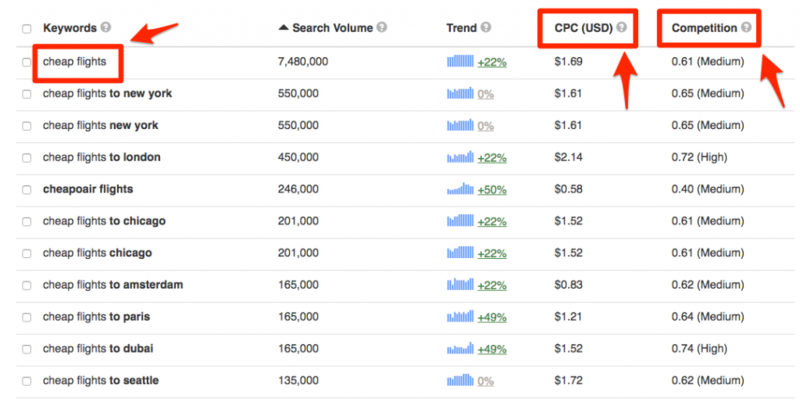 The way Google ranks keywords has changed a great deal. Today, the search engine algorithms place more importance on search intent rather than keyword search volume alone. Understanding search intent is key to ensuring your goals for the page, layout, and messaging will satisfy user intent of a search query. Due to the way Google Autocomplete functions, the feature shows a list of popular and trending terms that other people are searching. Autocomplete will not just give you a list of high-volume long-tail keywords but also sheds light on user intent behind the searches. It can help marketers view search volumes of related keywords and its variations to compare with different stages of intent. This method might be time-consuming but will prove to be an invaluable addition to a quality SEO strategy. When you search for a name, a brand, or a company on Google, you will see all related searches in the Autocomplete dropdown list. It shows the search terms that other people have entered that are related to your query. For example, if you are searching for a restaurant that has bad reviews, it might show in the Autocomplete list. It can potentially deter a potential customer away from the establishment and have a real impact on the business’ performance. Would you pay a visit to a restaurant if the top of the list of Autocomplete suggestions says “rats“? Most likely not. Merengue Restaurant in Boston became popular (for all the wrong reasons) when a video of rats running around in their dining section went viral. 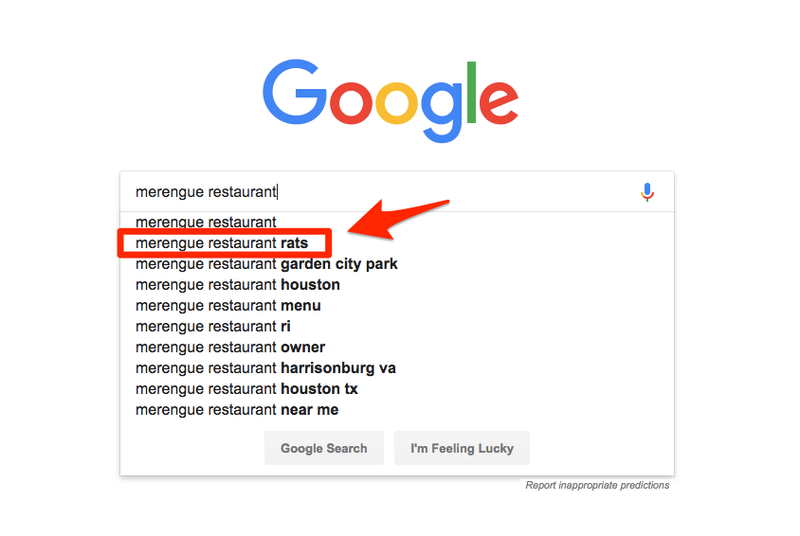 As more people searched for this viral news on Merengue Restaurant, the higher the search term climbed in its Google Autocomplete results. 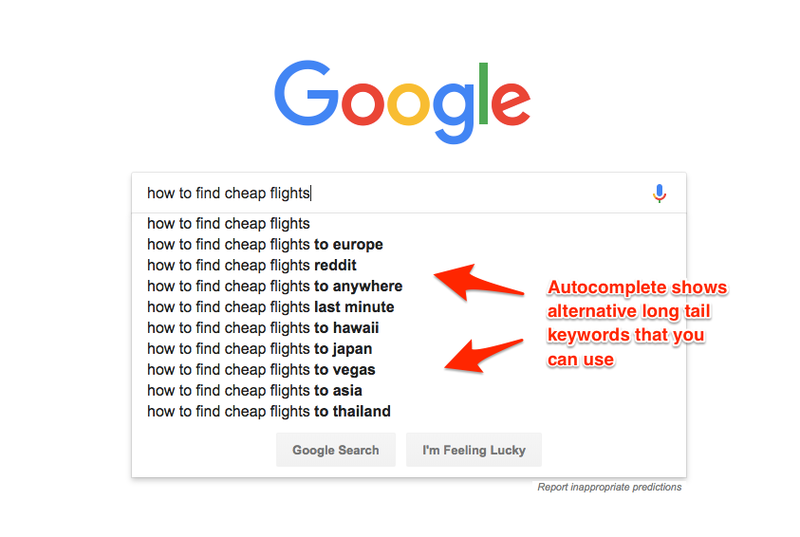 Google Autocomplete plays an unexpected and often overlooked role in online reputation management (ORM). Never ignore it and always ensure that it is consistently managed. There are many ways to offset negative Autocomplete predictions. Some ideas worth exploring like taking control of the conversations (on social media, forums, etc) and creating new content with strong backlinks.